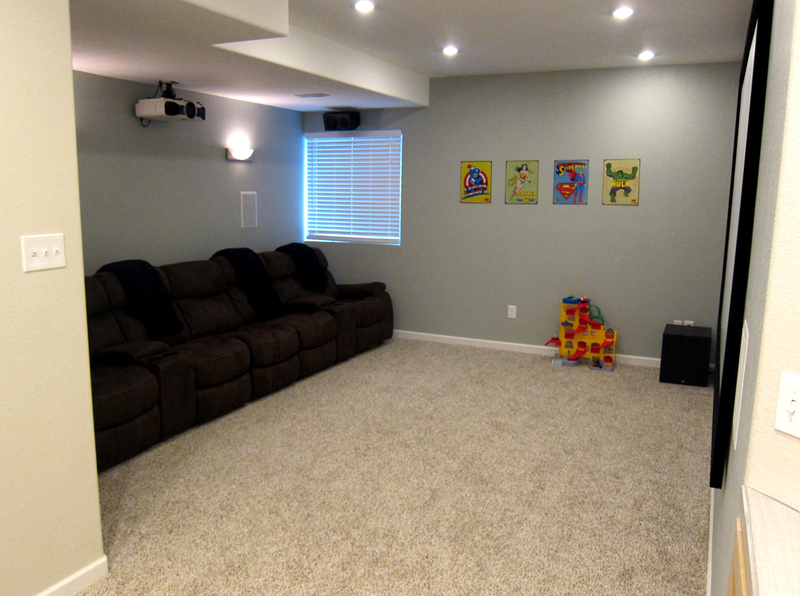 My basement home theater (along with the VIP shower) became sort of the focal point of my basement finishing project. 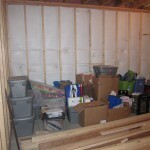 It was a huge motivator for me and one of the main reasons I decided to finish the basement off in the first place. 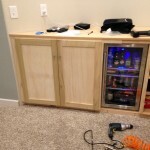 This post highlights my start to finish photos, but I also wanted to include some specifics on my home theater choices. I love to geek out so please feel free to comment with any questions ab0ut why I decided to go with what I did. 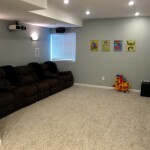 Better yet check out my Home Theater Forum page and get signed up, post topics, pictures, and questions about your home theater project. 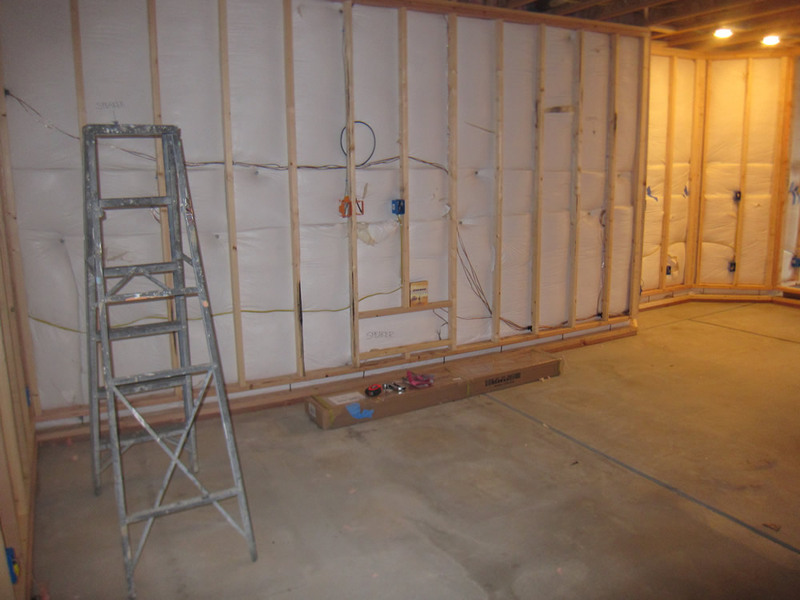 Basement Home Theater – Framing Stage – Framing the back wall and soffit, no more pipe! 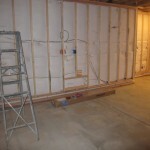 Basement Theater Room – Framing Stage – View from the hallway into the theater room. 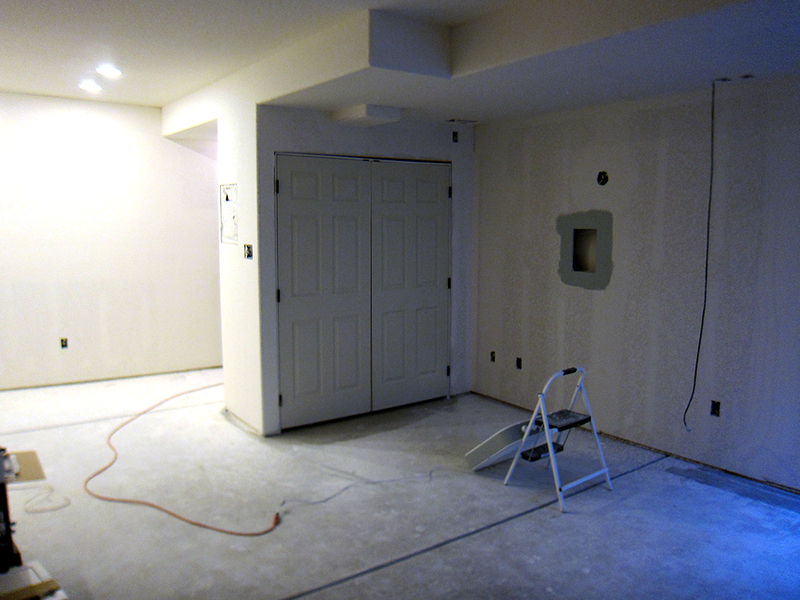 On the back wall is where the sectional will sit, with the projector mounted from the ceiling just above it. 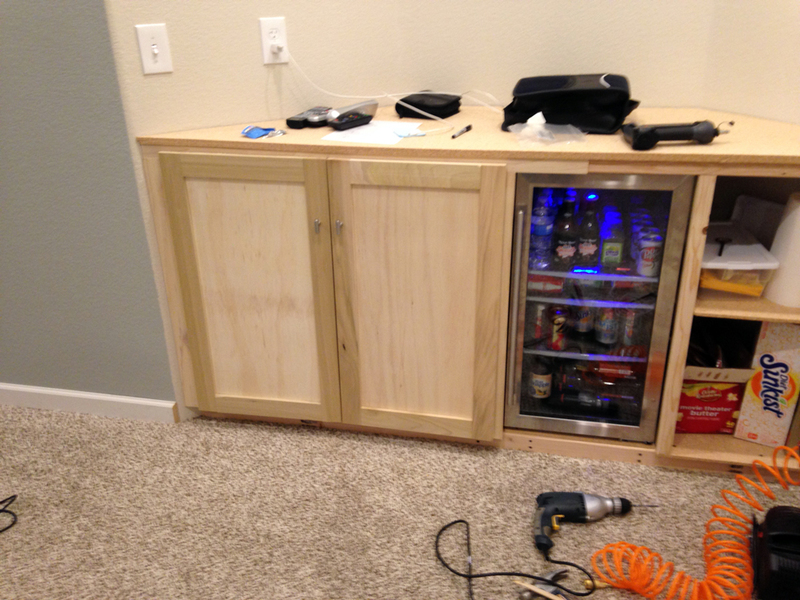 Basement Home Theater – Media bay cabinet finished! 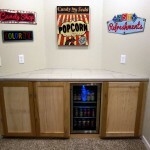 Basement Home Theater – Wall sconces lit and furniture looking comfy! 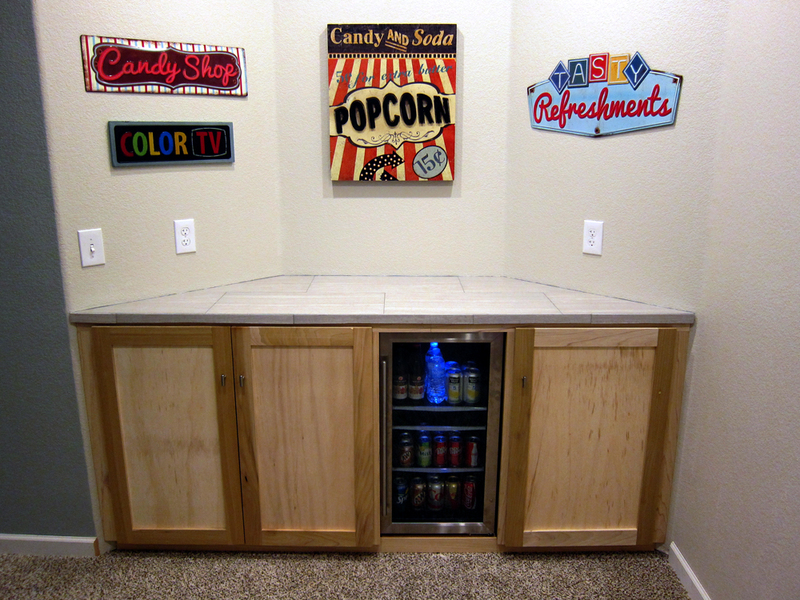 Are you planning a DIY home theater project? 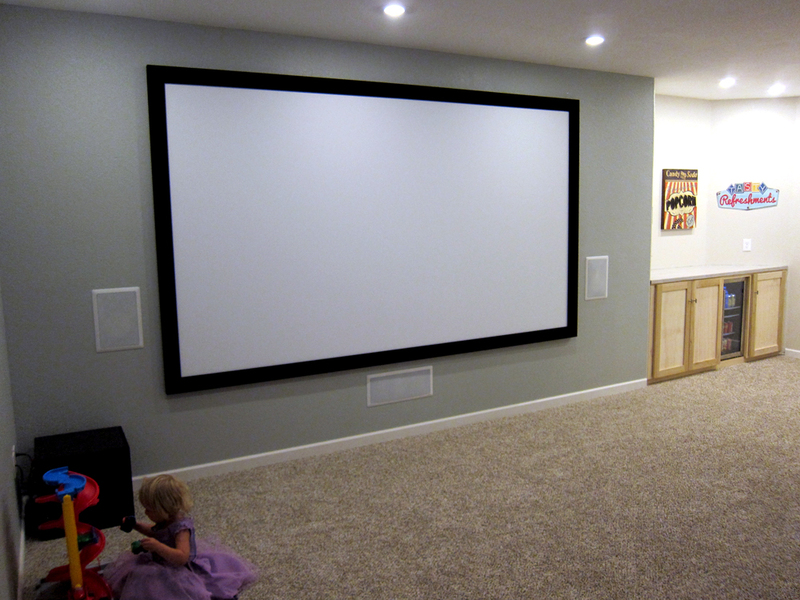 Do you have questions about your home theater setup? 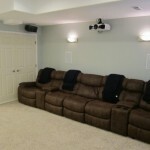 Hit the comments below or better yet JOIN MY HOME THEATER FORUM! 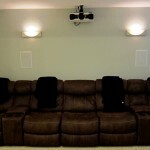 There you can post any number of topics or questions about home theaters. I’ve started a new section just for home theater pictures where you can brag about your home theater setup. 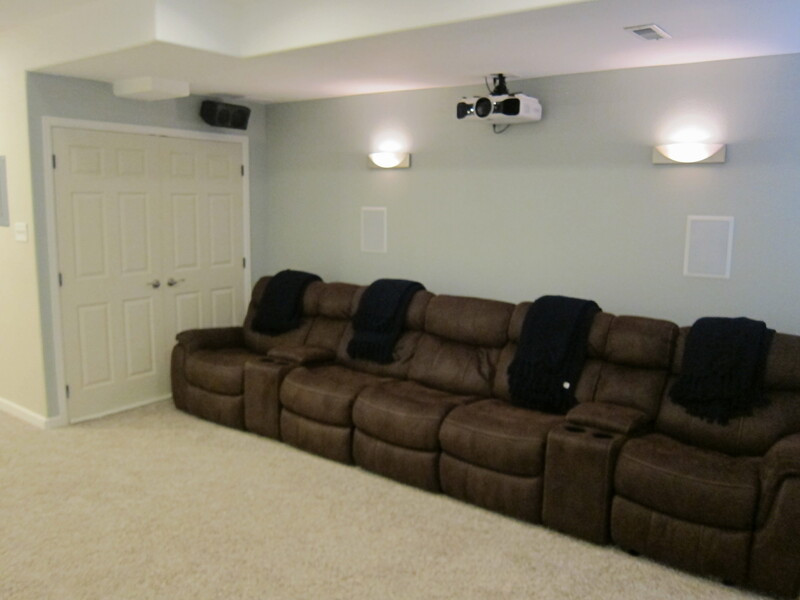 I’m always willing to share specifics on my home theater including screen, projector, light setup, or whatever your home theater-crazed mind wants to discuss! 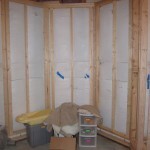 Did you consider sound proofing your home theater. when you turn on the volume do you have any effect in your first floor? 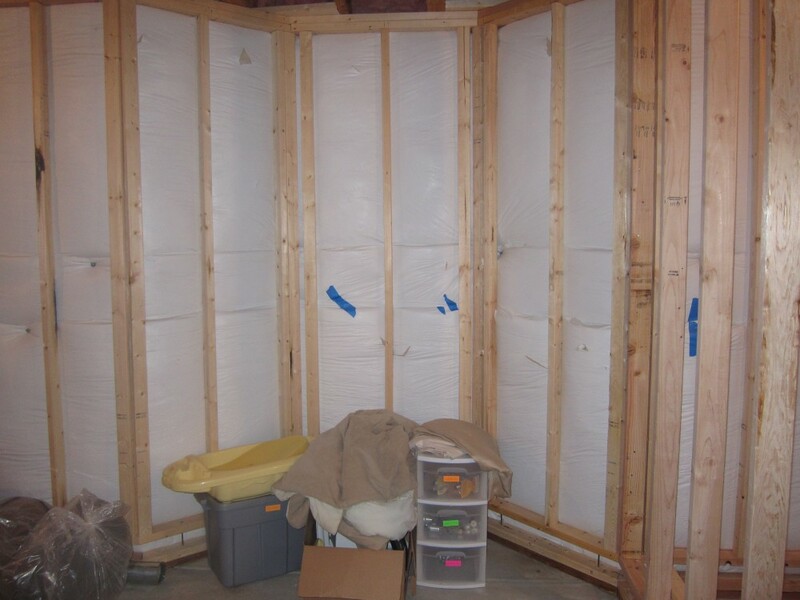 Yes, sound proofing was a major consideration when I decided on a home theater. 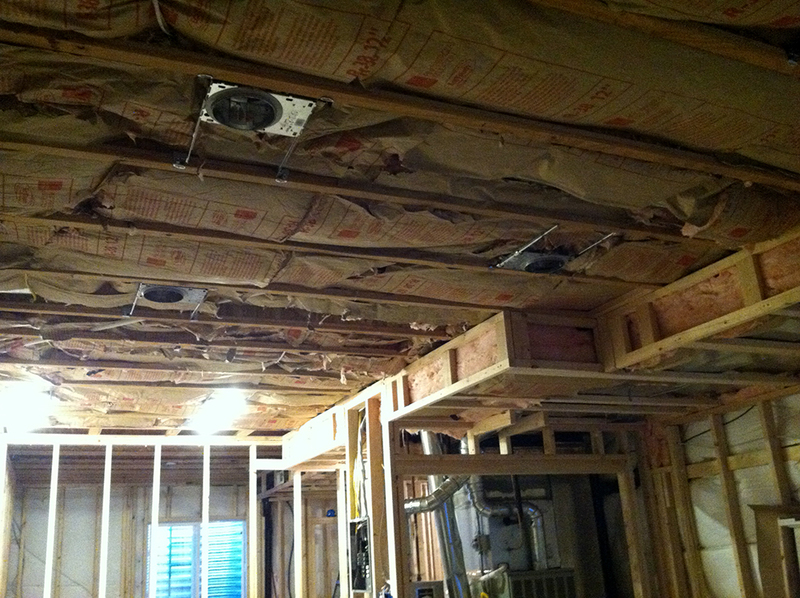 After a lot of research about doubling up the ceiling drywall, different insulations, suspended ceilings, green glue, and much more, I decided to go with the thickest insulation I could find and call it good. 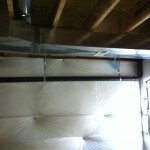 I had room enough for 12 inch insulation and installed it throughout my entire basement ceiling. When I’m watching an action movie with a lot of bass that gets the subwoofer involved, it can be heard on the first floor. It’s not enough to make a huge impression, but if the kids bedrooms were directly above the movie theater room it would be enough to annoy them and keep them up. Thankfully all the bedrooms are on the second floor and only if the volume is up high can the bass be slightly heard on the second floor. 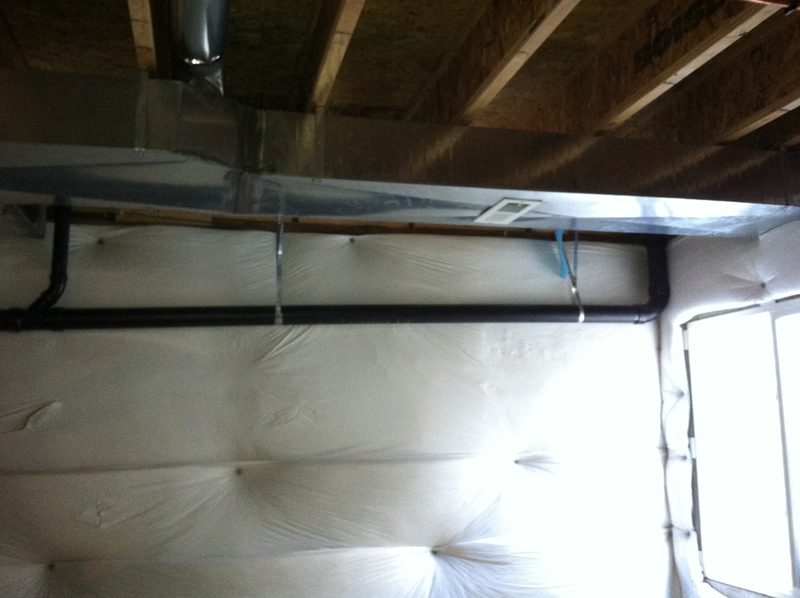 In the end the best solution I could find was something I didn’t want to spend the time or money on, which is basically furring strips installed in between the ceiling joists and the ceiling drywall. 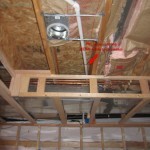 This helps separate your drywall from directly transferring sound to the ceiling joists. 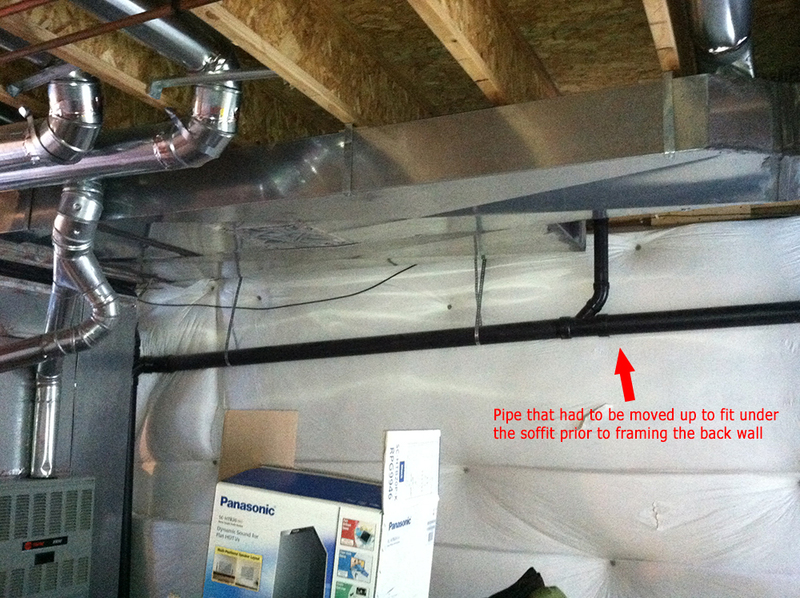 There are many options, but do some searches around “home theater furring strips” or “hat channel ceiling” and you should find some decent solutions. Well done Tony! Everything looks great. How do like the Pioneer IW871 speakers? We are getting ready to install those over the Xmas break here and started to have some doubts after testing out some PSB imagine speakers. Are you happy with their sound? Love the speakers, no complaints whatsoever. I can’t speak directly to the PSB Imagine speakers as I didn’t come across those in my research. 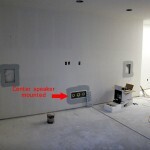 I knew I wanted in-wall speakers so that narrowed my focus when researching other speakers and reading reviews. 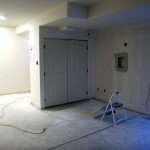 – I knew with the space in this room I wanted in-wall speakers to maximize the size of the room. 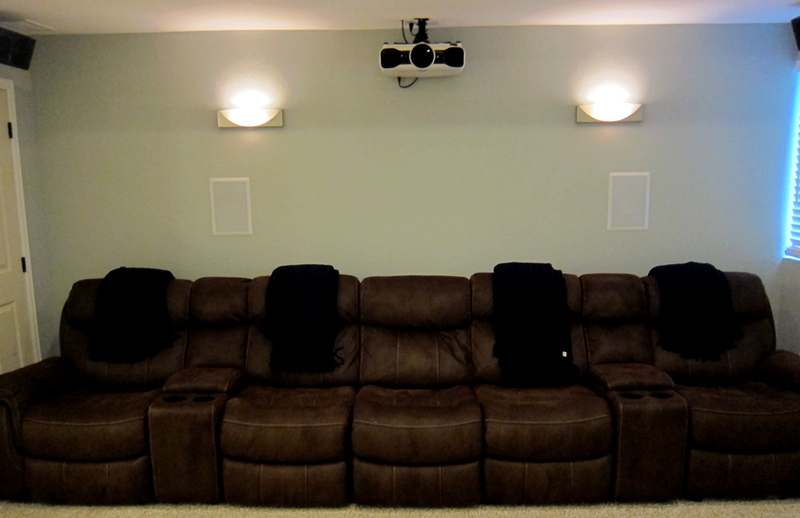 – My focus for my entire home theater project was mid to high-end equipment. I didn’t want to settle for budget equipment, and the Pioneer Elite In-Wall Speakers fell right into that range for me. – I knew my usage would be primarily for movies and not music, but I would still be playing music from time to time. 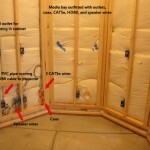 The Pioneer In-Walls were highly rated for both categories. – While I wanted to focus on mid to high-end equipment, budget was always a concern. I came across these speakers on eBay for a decent price. I couldn’t pass it up and decided to pull the trigger. After breaking them in over the past few months I’ve been more than pleased with my decision. Although I’m not cranking them up (I’ve got kids sleeping while we’re typically watching movies), I couldn’t be happier with the sound. If you have any specific questions about the speakers I’d be happy to answer those for you as well, just let me know! Tony, Great site with good pics! Your setup looks awesome! 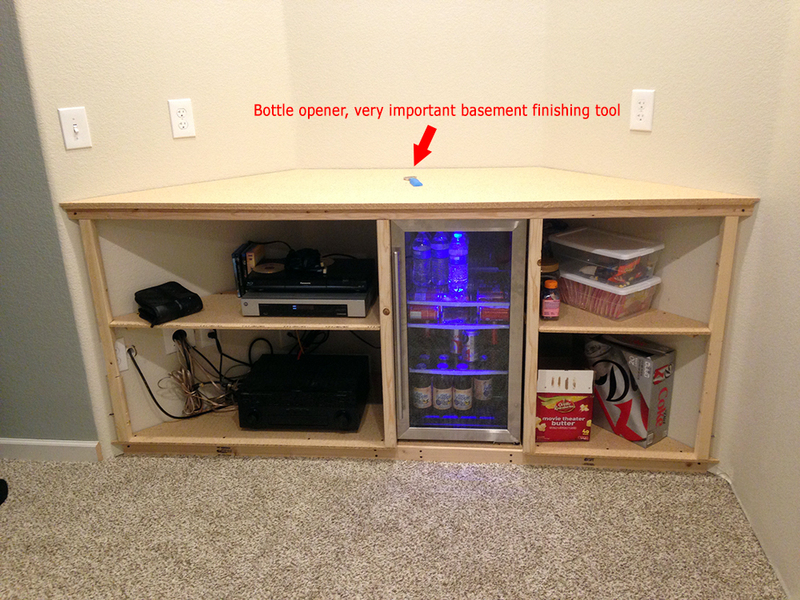 Working on similar setup in my basement and trying to figure out the wiring. Does your Coax cable allow you to watch cable or satellite? And I’m assuming your CAT5e cables are for internet? Thanks for the shout out! Yes the coax cable does allow for watching cable or satellite, you just need to be sure while you’re wiring that you’ve got a central hub where you can control the signal that’s sent to the coax cable jack for your home theater. If you’re getting a satellite or dish signal you’ll want to run a cable from outside to that central hub, or straight to the coax cable jack for your home theater. For cable usually you’ll get a cable box from your provider that plugs straight into your TV or receiver via HDMI and won’t require you to be tapped into your coax cable jack. And yes the CAT5e cables are for Internet. In hindsight I probably would go with CAT6 just to future-proof the network, but that decision is up to you. Again, thanks for the shout out and let me know if you have any other questions. So it looks like the only cables running up to your projector are a single HDMI and a CAT5e cable. Is that correct? Thanks for your response! I’m still in framing, but as I get closer to wiring I might pick your brain some more on things. That’s right, those are the only cables I ran to the projector. Other than that just be sure to put a power outlet on the ceiling and you’ll be good to go! 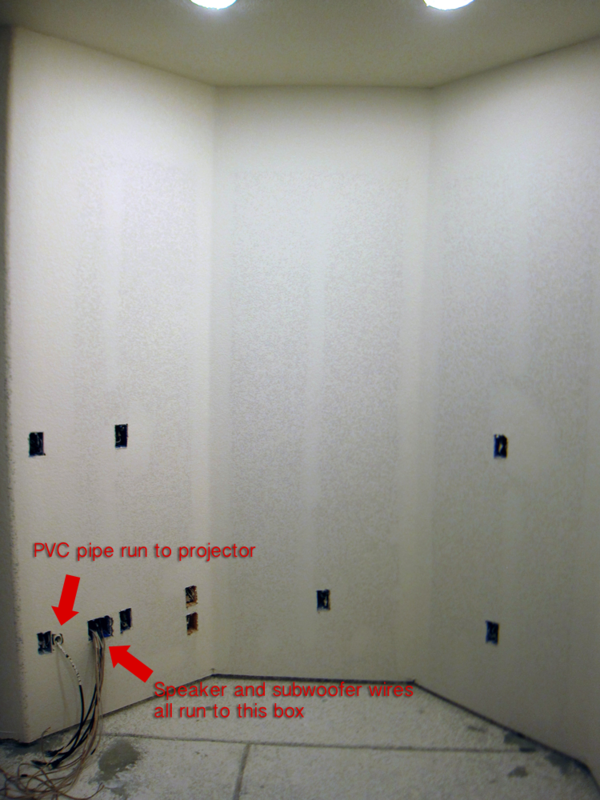 I also ran the in-wall PVC pipe which gives you flexibility to run any additional cables if you need them. Yeah feel free to ask any questions you have! 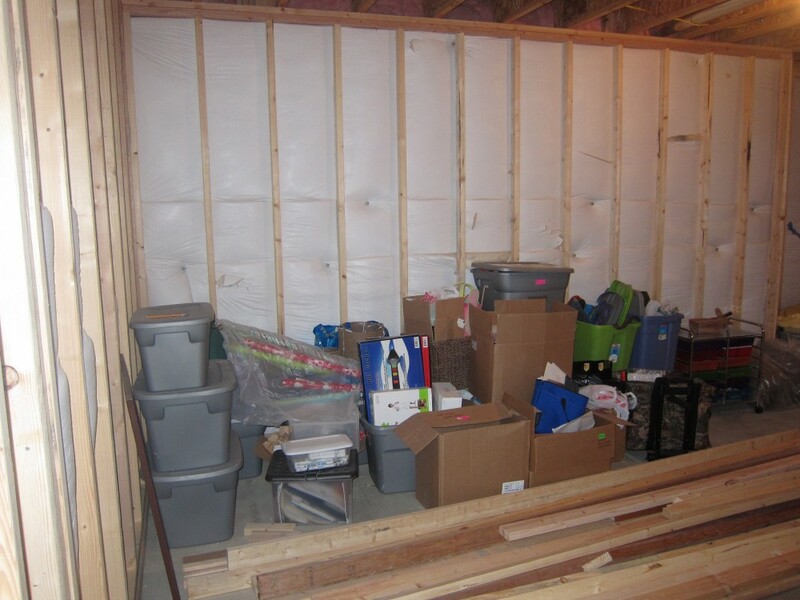 Tony looking to start my basement want a viewing room i love your set up but i have to support post the run in my basment i want to build a bar around and leave and the rest 0f the room enclosed. so basically while setting on the the other side of the bar outside of the viewing room you can see the screen but will the opening and light effect the projector pic if so i think i can install a pull down window when wanting to close off the room. also what are your dimensions in your theater? awesome sight by the way! Good stuff! Sounds like a great project. 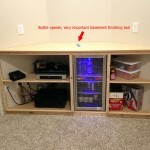 I see nothing wrong with your setup, it sounds very similar to my layout where I have the media center bay positioned outside of the theater room but there’s nothing separating them. You will have some light from the bar that can wash out your projector’s image, but if you find a decent enough projector with enough brightness (lumens) this won’t be a problem. With my Epson 5010 I have a “Living Room” setting I can use for just those situations where I have a lot of light. This cranks up the brightness on your projector to help make up for the ambient light in the room. 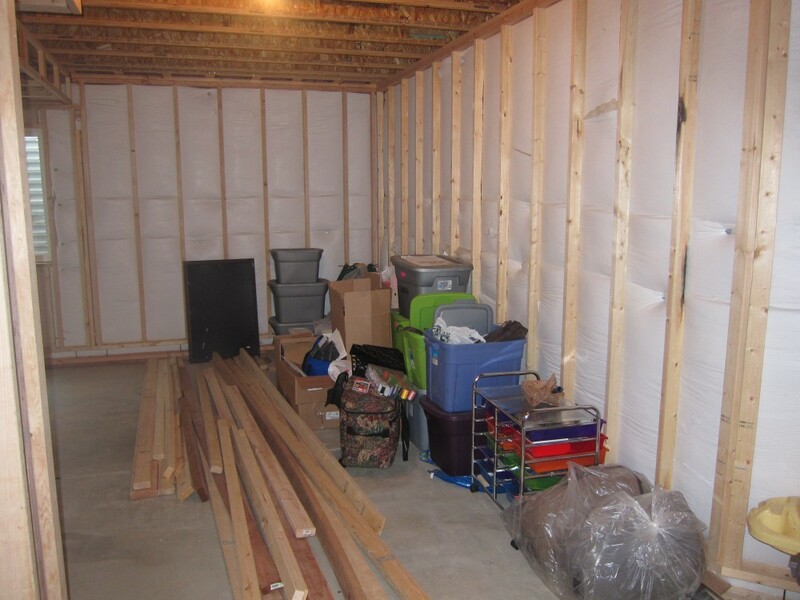 As for my theater room dimensions, they are 15′ X 14′. I’m very happy with this size. Let me know if you have any other questions Josh and best of luck! Where did you get your theater seating? I love it! Thanks! We really like it too, recliners and cupholders were a must! We ended up getting this at Furniture Row, Sofa Mart. The name of the sectional is called the Cloud. 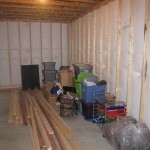 We just pieced together a few of the pieces in the sectional to fit our space. I’m looking online and only see 2 Cloud sectionals, a theater sofa and a recliner. How did you combine them into your configuration? Maybe there are different options for purchase in the store? Yes so we were able to mix and match when we went to the store. We grabbed two end recliners, two cupholder/storage pieces, and three middle recliners. They price each of the pieces separately in the store. Hopefully that helps! Do you like the center speaker? I mean, are you having any issues with dialog being too low compared to the other sounds? I have the same speakers, but am considering whether to use another of the siw871s to use as a center instead. Any thoughts? Yeah great question. We are very happy with the speakers so far. 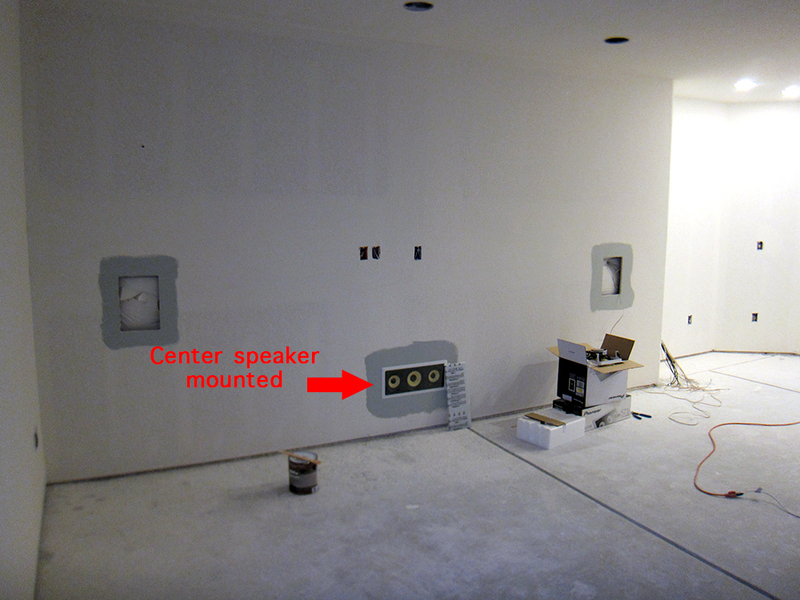 In hindsight I would have no problem using another SIW871 as the center speaker. At times dialog can be low and sound effects/music can be a bit louder, but overall it’s really not enough to be a bother. Very happy with them. 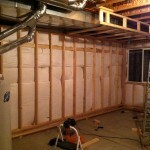 Great work on the home theater! Quick question, what is the distance from the bottom of your projector screen to the floor? Thanks a lot, been using it a ton and we love it. I’m not exactly sure but it’s right around 7 feet I would guess, maybe a bit more. I’ll check for sure tonight. Let me know if you have any other questions! I know you mention your screen being 132″, I’m assuming thats the diagonal. What is the width of your screen? (I’m not that good at math) And do you feel like that size has been about right or do you wish it was bigger or smaller? Thanks in advance! Thanks for the comment. Yes so the screen is 135″ measured diagonally. The width of the screen is just over 118″. Probably the biggest factor to take into account is the distance your seating is from the screen. In our case we are 11′-12′ from the screen. For me, this works out to be just about perfect for the size of the screen. Obviously you don’t want to be too close and have a huge screen, it would be like sitting in the front row at the movie theater. We’re at a comfortable distance where you get the whole picture without having to move your eyes around the screen. I wouldn’t go any bigger, but at this distance I’d be happy with anything larger than 110″ diagonally. Let me know if you have any other questions, thanks Chad! Super! Another one of my questions is how you mounted your projector. 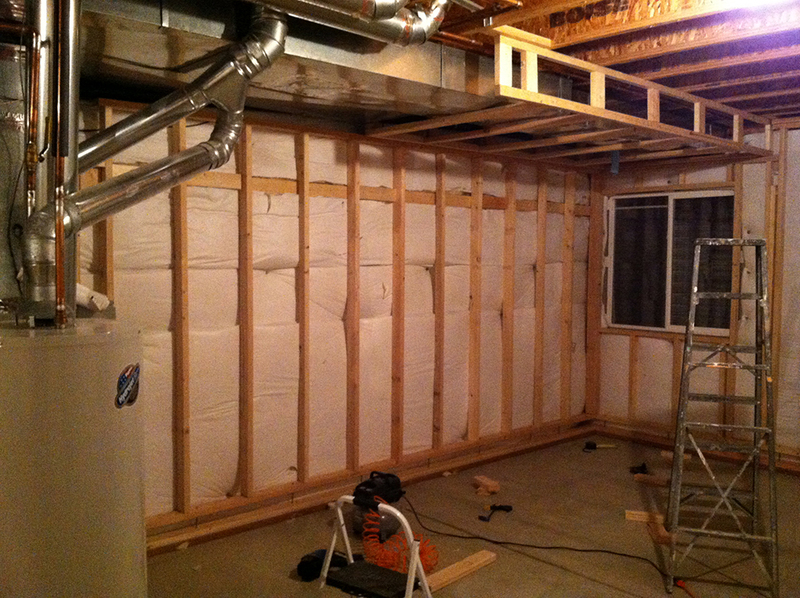 Before you put in your dry wall did you place some OSB board so you would have something to mount your projector to? Also, what kind of ceiling mount did you purchase? Learning a lot from your site. Thanks! 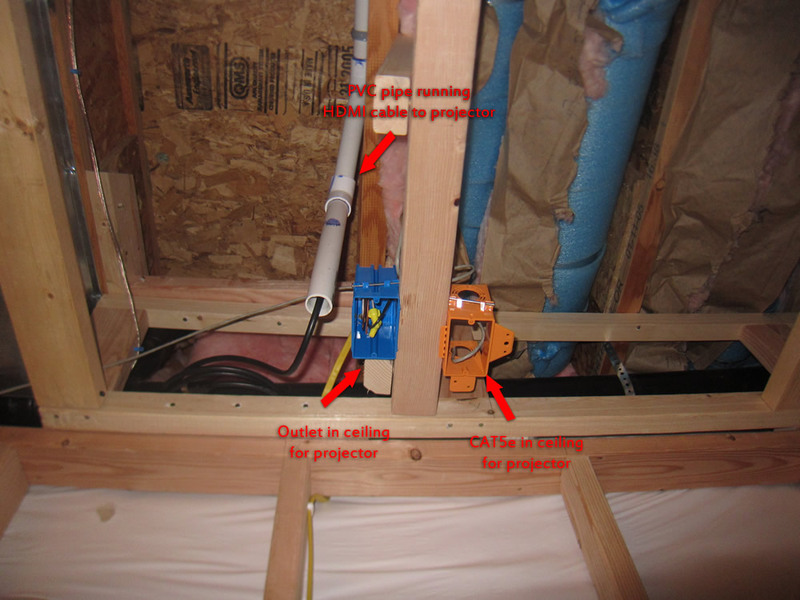 When I purchased my projector I bought a package from Visual Apex, click here for an example. The ceiling mount that came in this package was the Projector Ceiling Mount – AV-817U. 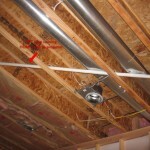 This is a universal ceiling mount that I believe Visual Apex manufactures. Again I’ve been very happy with it. Let me know if you have any other questions, thanks! Curious what your decision process was when deciding to go with a projector over an LED etc? Was it primarily size? Yes that’s correct, size was my first priority. I really wanted a “Home Theater” type of experience so I went as big as I could in the space. Because of that it just didn’t make sense to buy a 70″ TV that would have cost much more than the projector. In any other space a normal TV would have been fine, but I really wanted to go big in this room. Let me know if you have any other questions, thanks Cory! What size is your PVC pipe for running your HDMI cable? Any recommendations/words of wisdom on building this? Thanks! Thanks for the question. Yes so I wouldn’t go any bigger than a 2″ PCV pipe, that’s really as big as you’ll need unless you know you’ll have a ton of cables running through it. 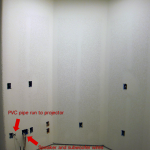 When I ran my PVC pipe from the media cabinet to the projector it was a good 30′-35′ with a few turns. I used 45 degree adapters and wherever those were installed, the wiring fish tape would get caught up and couldn’t get past them. The joint created too big of a gap that the fish tape would hang up. I went in with a file and basically filed down these sharp edges so they were more of a ramp. This helped a bunch. I think this only comes into play if you’ve got a really long PVC run, but still test it out! Tony, thanks for responding to all my questions, you have been a great help. Hope I’m not wearing out my welcome. 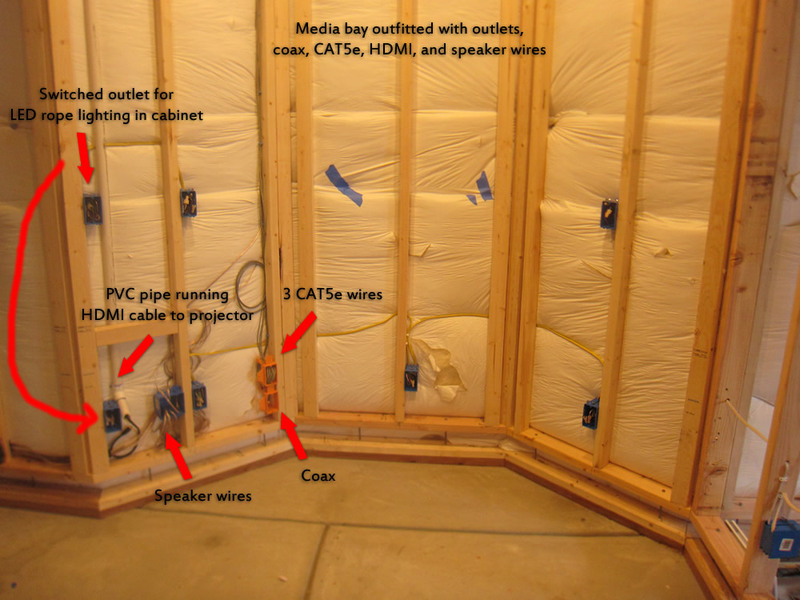 I’m beginning to run my speaker wires for my in-wall and ceiling speakers. 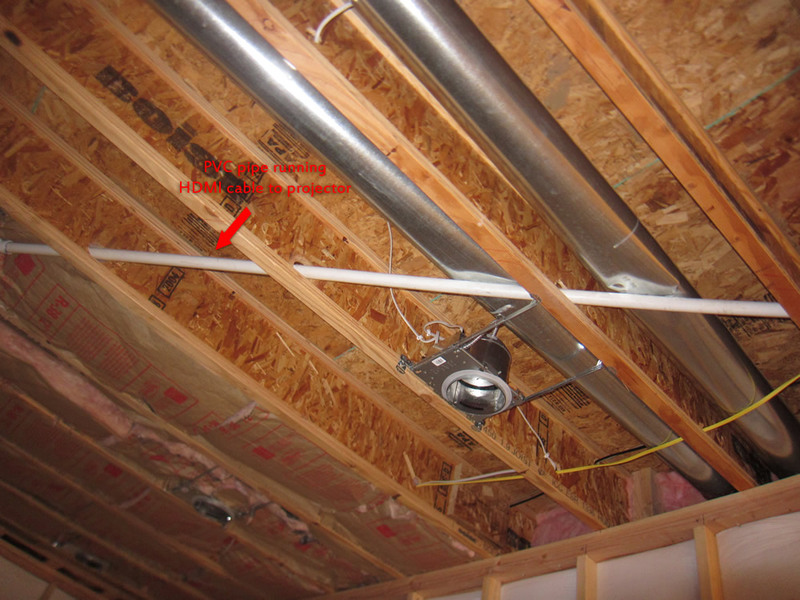 I’m curious if you used any staples to secure them into any studs or joists. I’ve read that metal staples can cause problems. What did you think? Any other advice for running my speaker wires would be welcomed. Thanks again! No worries at all, I really am glad to help! 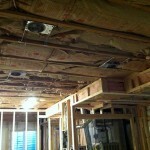 So for speaker wires I stayed away from staples as well, I didn’t do anything really to secure them to studs or joists. 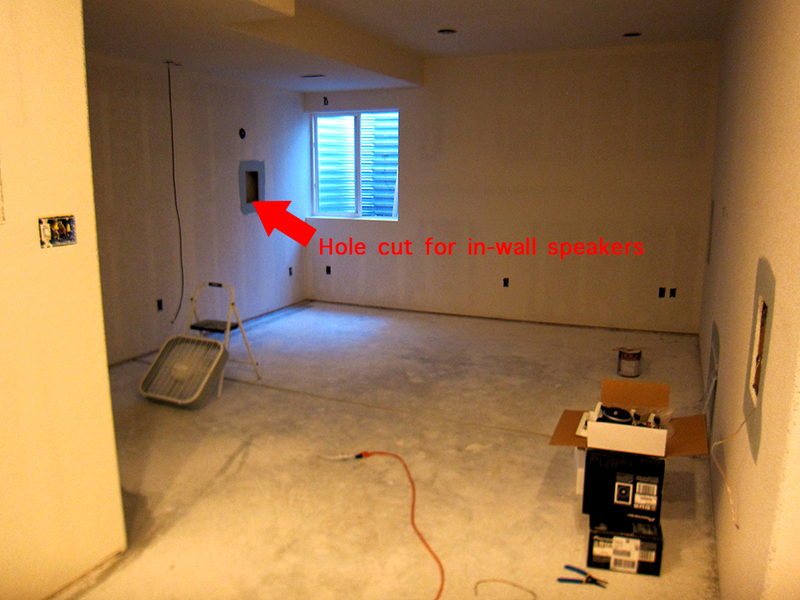 I was sure to run plenty of wire (in case I needed extra for some reason) and then I made big loops and just taped them wherever I would be cutting the holes in the drywall for the in-wall speakers. 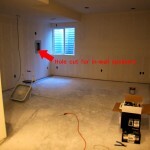 With low voltage wires like speaker wires you don’t need to worry about securing them to be up to code. 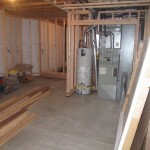 Tony, I’m getting ready to start dry wall! I don’t currently have satellite, but probably will eventually. 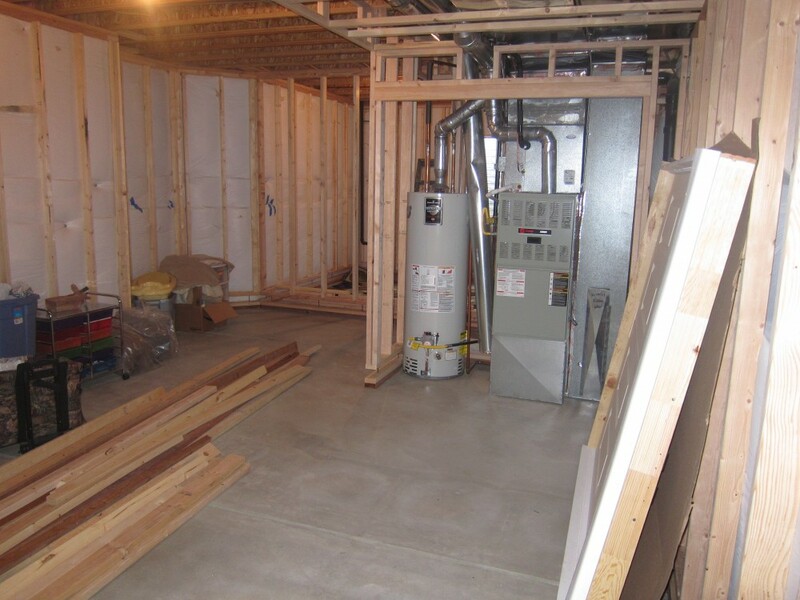 Do you know if running a coax cable from the outside (where the future dish will be) directly to a wall jack in the basement is sufficient for future dish installation? Any reason to run more than one cable? 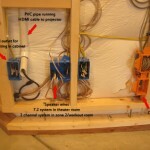 I’m trying to avoid the headache of having to run wiring through finished walls in the future if at all possible. Thanks for your help! Awesome, this is such a crucial stage right before drywalling because you save so many headaches by doing some simple things like this. 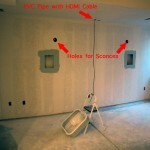 Do you have any coax cable in the house currently? If so, I would try and find a central hub where most of the coax cables meet (usually in the basement) and run your cable to that point. There really wouldn’t be a reason to run more than one, unless you’ve got a few spots in the basement where you’d like to have TV’s someday. 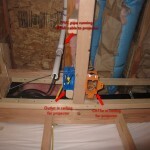 If so, then I would run coax from your central hub to those points as well before drywalling. 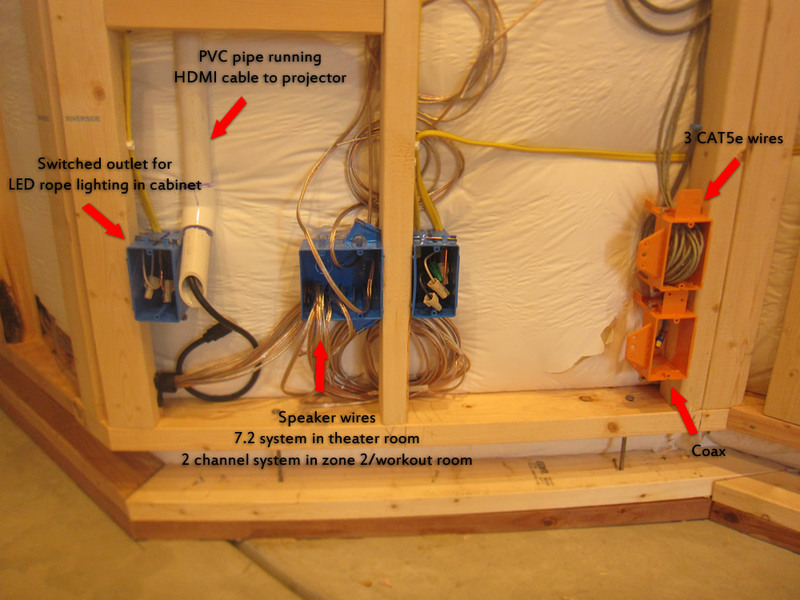 Other things to think about would be ethernet cable, speaker wiring, PVC pipe for mounted TVs, and even things like gas lines. One thing I wish I would have done is to tap into my water heater gas line and run a pipe up under our oven for a gas range if we ever wanted one. 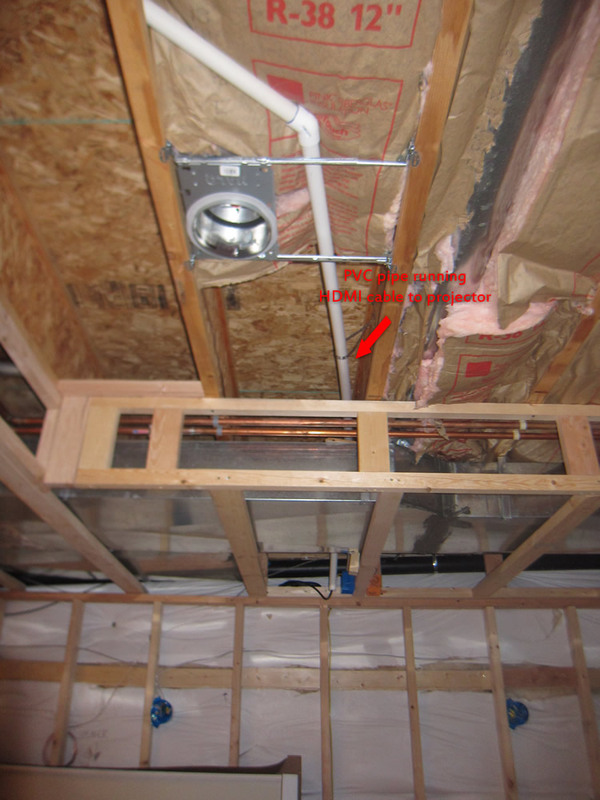 Hopefully that answers your question and if you’re ever in doubt, always run cable because it’s a nightmare to do it after drywall! Thanks Chad and let me know if you have any other questions. Awesome set up! I am envious! I am curious, how many inches is the bottom of the center channel up from the floor? 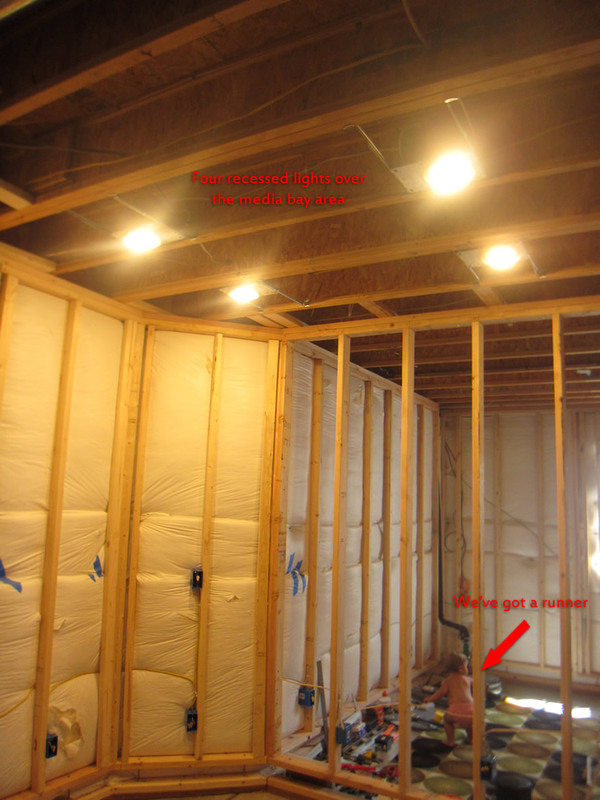 I am building a house and I am doing a 5.2.1 Dolby Atmos set up in a 13.5 X 16 ft room. The bottom of my in wall center is 23 inches from the floor. How does yours sound at that height? So the bottom of my center channel is about 10″ from the bottom of the floor. I don’t have anything to compare it to, but I’ve been more than happy with the performance of my speakers. Ideally I’d like it to be higher, closer to your 23″ height, but I have no complaints with where mine is at today. Let me know if you have any other questions. 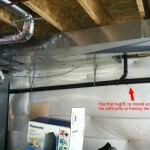 (1) i know there is a hub for coax in basement but cant find it. 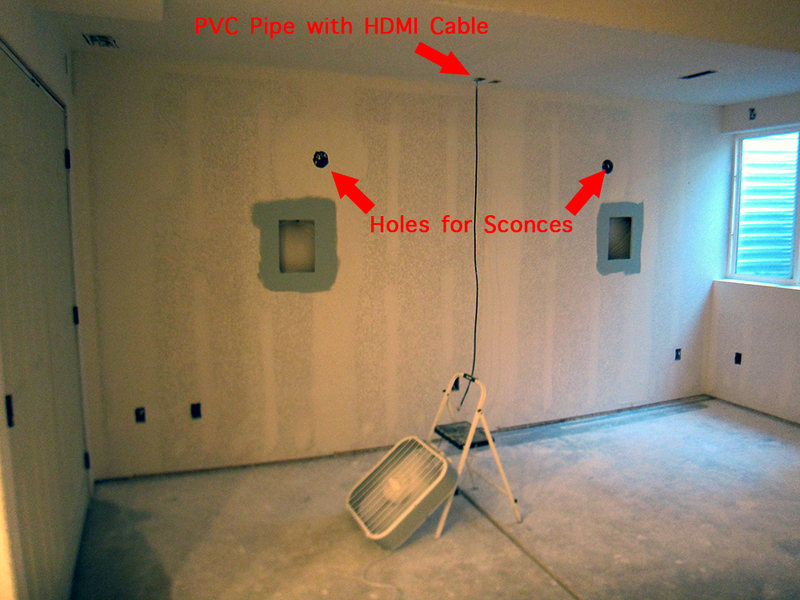 Can I just split the coax that I see in basement and take it my AV rack and the wall where my future Tv would be? (2) One CATe goes to ceiling for projector. Where do the other two go? 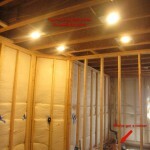 There is a hub for coax in the basement but I don’t highlight it on the site. It’s actually in the storage closet. Yes you should be able to just split your coax and be just fine! The other CATe runs go to my media bay center and the bedroom. Let me know if you have any other questions and best of luck Vin! Hey Tony! I really like what you did with the home theater. 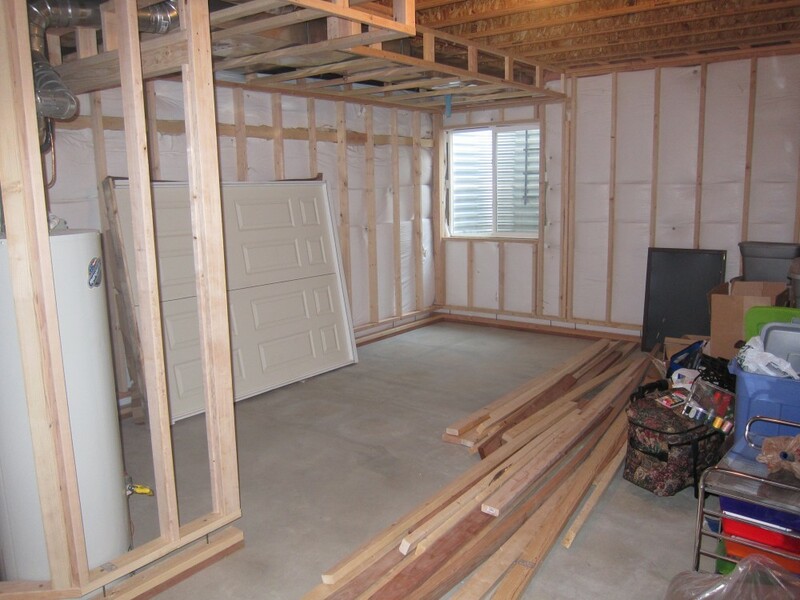 How long did it take you to complete the project from start to finish? Thanks Doc! The whole project took me about 9 months to complete. Very happy with how everything came out! 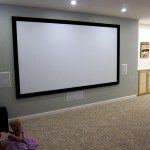 I want a home theatre in my basement like a original movie theatre.what cost will be ???? 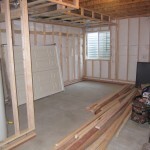 What a basement makeover Tony! I really appreciate your makeover idea.